Sensei's Writings With Shudo Maruyama Sensei. Cold Sake and Sensei’s Lessons. For me, it is lessons learned from one of my teachers, Shudo Maruyama Sensei. I have written another article about Maruyama Sensei, titled “The Silent Pioneer: Shudo Maruyama Sensei, Kokikai Founder. Reading this article will allow for better understanding of this article to follow. I received a call from Shudo Sensei early this fall where he said to me, “I need to check on one of my deshi (students). I need to see if he is alive or not, and what kind of life he has made for himself. I also want to go antique shopping.” He was talking about me of course, and we arranged for him to visit my dojo. “I had no more space in my house.” He told me. “The floors were falling in there was so much stuff in there. I had to move to into a bigger house just to find a place for it all.” This comment accurately describes how much of an avid antique collector he really is. Especially knowledgeable about Japanese swords and martial art history in Japan, Shudo Sensei has the expertise of a professional appraiser. In 1976, I traveled to the United States and stayed with Shudo Sensei in Philadelphia. While I stayed at Shudu Sensei’s home, I went often with him on his antique hunting expeditions. On weekends we would rise before dawn to go to the gun shows and antique markets, always arriving first before the doors were even open. Driving in the predawn hours, Shudo Sensei would say that every car on the road was headed to the markets as well, and hurried even faster to get there. It was a joke of course, but he did drive even faster towards our destination. In 1976 many Japanese swords could be found on the East Coast, most of them souvenirs from WW2 veterans. The Japanese swords that were prominently displayed on the dealer’s tables were in good condition with ornate casework, tsubas (hilt guards) and handle wrapping. These swords were marketable because they were in good condition, beautiful to look at and could be used for decoration; the maker and condition of the blades were of secondary importance. Shudo Sensei ignored the shiny display swords and looked carefully instead among piles of rusty spears of unknown origin stuck in dusty barrels on the sides of the display tables, or tied in bundles and cast forgotten on the floors. Complaining all the while that he no money, he would buy whole bundles or barrels full at a time. Among the rusted shafts would be treasures that only someone with Shudo Sensei’s expertise could recognize. Now, so many years later, as I stand before my own students, I reflect on the years that have passed since then, and how much of life I have seen in the meantime. Finally, the lessons Shudo Sensei was trying to teach me about the swords so long ago, begins to dawn on me. He was teaching about the unimportance of outside appearance and meaningless decorations. He was showing me the importance of casting off what is not important, be that a decorative sword casing or expectations and attachments in our human psyche. He was teaching me the importance of being free of these trappings and concentrating on the heart or the inner blade; the importance of finding ones own way in life. What he showed me so long ago, I am finally realizing had a profound effect on my life. 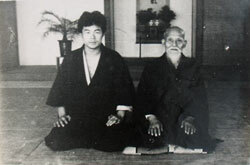 Aikido Founder Morihei Ueshiba and Maruyama Sensei. clean cut of a fine sword, his life has been the straight cut of a true martial artist’s life. Too much today, I see instructors that hide themselves in the uniform of a particular organization, and brandish titles about like dull swords. Shudo Sensei’s understanding as a martial artist is on a completely different level. He is not interested in fame in the Aikido media, and never seeks the spotlight. He silently carries on his pursuits and study in his own way, in his own time. Today in the United States, Shudo Sensei has a large, successful Aikido organization, but the road to his success has not been an easy one. As a young man, Shudo Sensei was involved as an innocent party in a serious car accident that left him hanging between life and death. To return from this precipice, would take a miracle. Yet he survived this trial, and returned to stand in his own dojo again. He has said about that time, “As I went through my rehabilitation, I seriously questioned my own my physical power and my abilities to overcome the debilitation of my injuries. Finally however, I came to a realization, and a special feeling came over me. My Aikido technique and philosophy changed dramatically for me at that time and forever.” Shudo Sensei’s students at the time can attest to these radical changes. 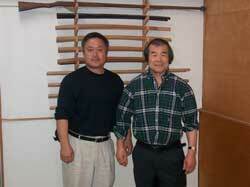 During his seminars, Shudo Sensei is famous for pointing out how skinny his arms are, or how light his body is. “I am so small.” He says laughingly, singing Scarborough Fair while he flattens a strong Aikidoist with his technique. To reach this level of understanding, one has to have experienced and survived life’s hardest struggles and challenges. Students at his seminars laugh out loud at his jokes, but the jokes are not manufactured, they are born from real experience. While I was living at Shudo Sensei’s home in Philadelphia in 1976, I would sometimes hear a sound as I drifted off to sleep in my room. It was a strange sound, repeated over and over, and I could not make the connection on what it was. One evening I heard the sound and got up to investigate. I peeked into the living room to see what the noise was. There was Shudo Sensei sitting in seiza, slowly swinging a sword up and down in concise, deliberate strokes. I realized what the sound had been. It was the sound of his strong hands squeezing the sword at the bottom of each stroke to stop the blade. It is not an easy sound to make and takes years of practice. After finishing this exercise, I watched as he continued with hundreds of kokyu curls performed with a one pound dumbbell. Now I reflected, Shudo Sensei’s small body is strong because of these exercises he began so long ago.Shudo Sensei’s United States based organization of Kokikai Aikido has branches all over the world. His seminars attract three hundred students at a time, and yet he is not well known in the over-all world Aikido community. This too I believe is a conscious result of Shudo Sensei’s attention to the blade and not the outside trappings surrounding it. There are a few popular, indeed famous Japanese martial art instructors that have taken techniques or concepts they might have found in old martial art books and reinvented them for today’s market. They have become today’s “media martial artists”, the focus of videos, magazines and other media outlets, yet their expertise is born more out of replication than understanding through personal trial and experience. Shudo Sensei’s style of living is like the clean blade inside, unburdened by the trappings of the case without. I have found inspiration in his life, and the way he has learned from and overcome the obstacles that have come in his path. He has given me direction for my life like the pure light shining from the lighthouse.